Meet Eevee, the Evolution PKMN! 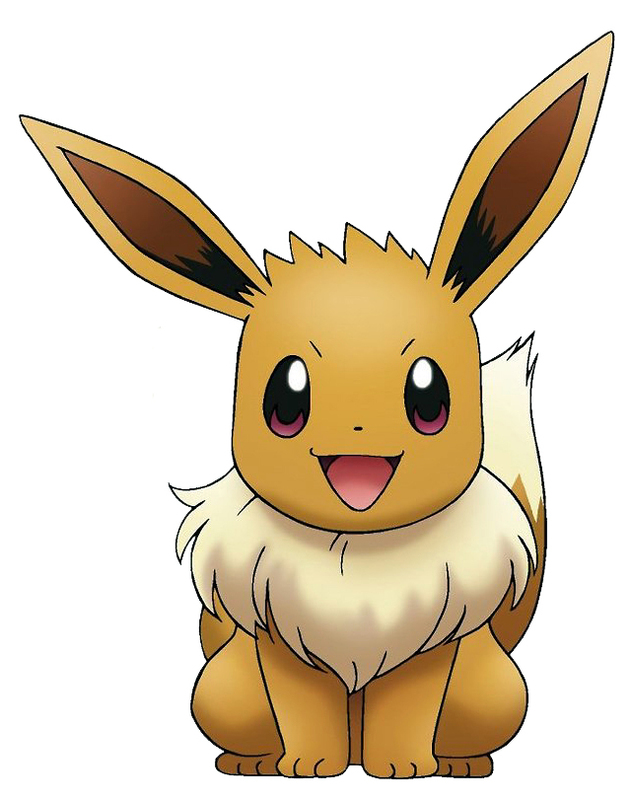 Eevee is a Normal-type, with a weakness only to Fighting-types, and an inability to harm Ghost-types. 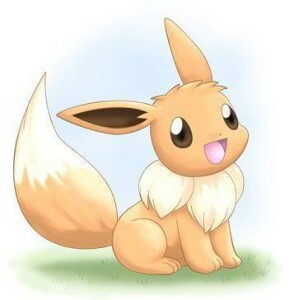 Eevee is 1′, with the common abilities Run Away and Adaptability, or the hidden ability Anticipation. 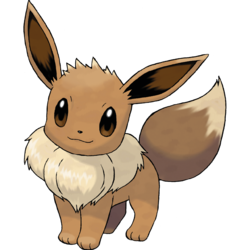 Eevee has a very unique and almost flimsy genetic code that allows them to have the largest variety of PKMN evolutions in PKMN history. Normally I like to write my posts with the PKMN in order of my list, but since all of the other PKMN in this post are “eeveelutions”, otherwise known as evolutions of Eevee, I figured it would be good to cover the base ‘mon first. Ah, Eevee. My first PKMN love. The first time I ever encountered Eevee was, ironically, due to the workings of my cousin, who doesn’t even play PKMN. She told me that Eevee was an incredible PKMN that could use every move, was every type at once, and was by far one of the cutest ‘mon out there. Like I said, my cousin doesn’t play PKMN, and she didn’t back then either. However, the ball had started rolling, and not only did I find Eevee adorable when I started, but I wanted one of my very own. It took me a really long time to find one, I didn’t manage to actually acquire one until I got my PKMN Platinum game, and during that period of time I quickly learned that this “miracle PKMN” my cousin had talked about, probably wasn’t as awesome as she had said. But still, the day I finally got my Eevee was one of the best days of my PKMN career. 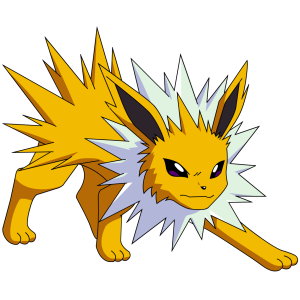 I really wanted to evolve my Eevee into a Jolteon, but I also really wanted to evolve my Eevee period, and so when my sister found a Fire Stone in her game, and I found a Water Stone in mine, we both traded items and used the stones to evolve our Eevees. Using the Fire Stone she gave me, I evolved my very first Eevee into a Flareon, and using the Water Stone I gave her, my sister evolved her very first Eevee into a Vaporeon. 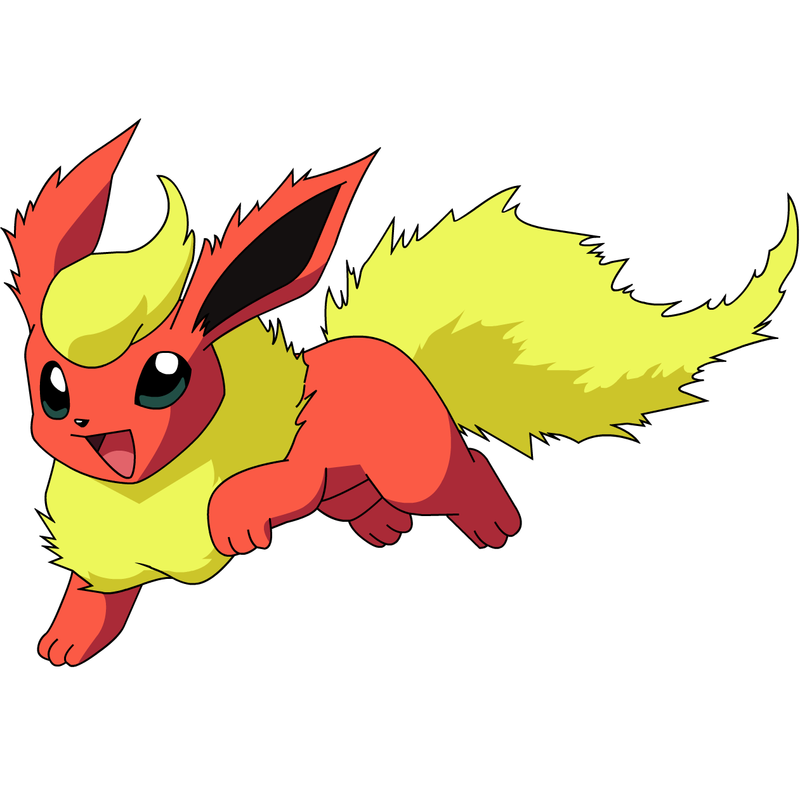 I loved Flareon so much, he became my contest star, and one of my favorite PKMN to use in battle. From there, my love of Eevee only grew, until I was continually breeding them, raising them, and trading them with others. I learned all the ways to evolve Eevee, and eventually I had (and still have) every “eeveelution”. I started giving every Eevee I hatched a name all to itself, like Charlie or Diana, and I still do. Yes, I still breed Eevee, despite the fact that their evolutions might not be considered the best. 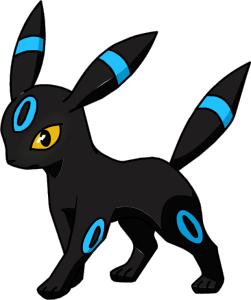 One of my PKMN dreams is to have a shiny version of every “eeveelution”, but at the moment I will settle for just one shiny Eevee that I can evolve into an Umbreon. Eevee are fairly basic PKMN, with their best base stat being a Special Defense of 65, and their worst stat being their regular Defense at only 50. Like I said, Eevee aren’t really considered the best PKMN, but that’s not where their novelty lies. Eevee can learn impressive moves like Double-Edge, Last Resort, and Trump Card if you level it up high enough before evolving, and moves like Dig, Shadow Ball, Retaliate, and more if you have the right TMs. Like I said, moves and stats aren’t Eevee’s shtick. Eevee’s shtick is its eight “eeveelutions”: Espeon, Umbreon, Flareon, Jolteon, Vaporeon, Leafeon, Glaceon, and Sylveon. I love all of these as much as I love Eevee, and (SPOILER ALERT! ), I plan to give the character Zoe in my up-coming PKMN story one of every “eeveelution”, and as such, I’ve planned out character profiles for each one. So I figured, instead of giving you just boring old stats and facts, I’d introduce you to all of the “eeveelution” characters instead! In order of the count-down of course. So, here we go! Meet Apollo, PKMN No. 6 on the count-down! Like all Espeon, Apollo evolved through leveling up in sunlight, will also sharing a strong bond of friendship with Zoe. Known to use the move Psychic to help Zoe out in a jam, Apollo has a high base Special Attack of 130, and a fairly good base Speed of 110 to help rush to his siblings’ aid when necessary (which can feel like a lot sometimes). While not as rambunctious as the others, Apollo has been known to cut loose and have fun every once in a while. His weaknesses are Bug-types, Dark-types, and Ghost-types, but he has a great strength against Fighting-types. 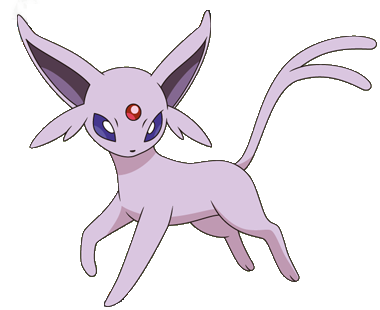 Though he has the common ability Synchronize, Espeon have been known to have the hidden ability Magic Bounce, and they are all 2′ 11″. Apollo has been known on occasion to enjoy spending his time exploring, whether he’s in the city, or out in the country. He has a pair of glasses he wears on a chain around his neck because he’s actually a bit far-sighted and needs them from time-to-time. Meet Marcel, PKMN No. 5.5 of the count-down. If it’s one thing Marcel loves, it’s being seen. Whether it’s showing off in battle, or dreaming of being a movie star, Marcel just loves attention. Because of this, he has a tendency to get jealous when one of his siblings happens to be in the spotlight, and may or may not slyly use a Flamethrower or Lava Plume to bring their fifteen seconds of fame a little short. Like all Flareon, Marcel evolved when Zoe allowed him to come into contact with a Fire Stone. Marcel isn’t much into battling, but when he joins one he tends to find that, like all Fire-types, he has weaknesses to Rock-types, Ground-types, and Water-types, but strengths against Grass-types, Ice-types, and Steel-types. He might have a base Attack stat of 130, which his best base, but that doesn’t change the fact that physical labor isn’t really his “thing”. He’s 2′ 11″ like his brother Apollo, and it is Marcel’s biggest dream to be a famous movie star, adored by all. He doesn’t wear a fashion item like any of his siblings; however he does use a special leave-in conditioner that leaves glitter in his fur for some extra dazzle. Additional Fact: Likes to fight. Check it out, it’s Turbo! Turbo’s No. 5 on the good old fashioned count-down, and what a guy. Turbo is a fast-paced lightning machine, what with a base Speed stat of 130, and the hidden ability Quick Feet, which gives him a 50% increase to his Speed stat if he happens to get hit with a status effect like Burn. Unlike Marcel, Turbo really loves to battle; like, really loves to battle. He’ll bust out his Pin Missile, Thunder Fang, or Quick Attack whenever the chance arrives, but he’s been known on occasion to go a little…overboard. The fact that he’s so full of energy is actually the main reason Zoe used a Thunder Stone to evolve Turbo into a Jolteon. Generally, he’s a very friendly guy, and he likes to help his little brother Glen try and find a girlfriend; maybe a little too much help. He’s 2′ 7″, a little shorter than his brothers, and he might have the hidden ability Quick Feet, but sometimes he actually wishes he had the common ability Volt Absorb instead, which is a secret he hasn’t even told his siblings; even though they’ve pretty much figured it out by now. He finds Rock-types and Ground-types super annoying, but he likes battling Flying-types and Water-types because he beats them most of the time. He wears a silver clip-on earring on one ear because he thinks it makes him look intimidating. Additional Fact: Impetuous and silly. Aw, Sylvia! Sylvia’s No. 4.5 on our count-down, and she’s also the youngest of the bunch. 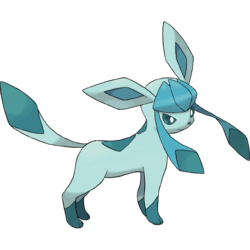 Ironically, she’s also the tallest of the “eeveelution” siblings, at 3′ 3″. Sylvia often prefers playing to battling, but she’s always willing to jump in when Zoe needs her. This characteristic is well matched by her base Special Defense, at a very impressive 130. Considering there’s only ever a 12.5% chance of getting a female Eevee verses a male, Sylvia is the only girl in the family, but with Bree around she generally doesn’t mind. If she ever needs, Sylvia can use Baby-doll Eyes, her only Fairy-type move, to get her brothers to do what she wants. She also doesn’t mind the fact that she doesn’t have the hidden ability Pixilate either. Of course, Sylvia’s very attached to her trainer, since an Eevee needs to both have a strong love for their trainer and know a Fairy-type move to evolve into a Sylveon, and sometimes she cries when she has to spend the night by herself. She’s weak to Steel-types and Poison-types, but she likes Dragon-types a lot and loves to give them big hugs. 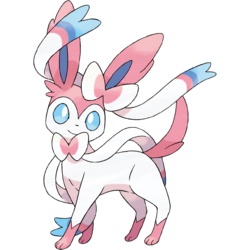 As an Eevee she used to constantly wear a big pink bow around her neck, and her neck feelers are now mysteriously a darker pink than most Sylveons’ tend to be. Additional Fact: Quick to flee. Here’s Moses, No. 4 on the count-down. Moses is a very shy guy, who quakes in fear at the idea of battle, almost everything loud or equipped with blinking lights. He might have a base Health stat of 130, but that doesn’t mean he’s going to survive very long in battle, considering the fact he’s often to afraid to step out onto the battle field, let alone use one of the Water-type moves Zoe used a TM to teach him, such as Scald. However, when given the time and patience, Moses has proven himself to be helpful in the field, with moves such as Surf and Dive, allowing his trainer to explore vast reaches of the aquatic world. As tall as Sylvia, Moses has a strong respect for her and his brothers, often privately wishing he had their courage, and secretly striving every day to become as brave as them, and to have the hidden ability Hydration instead of his regular ability. 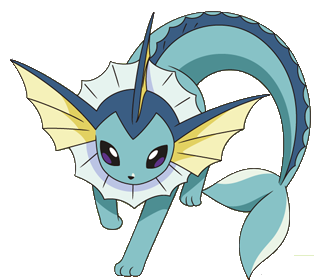 Even as an Eevee, Moses always felt safer and more comfortable in the water, and so Zoe used a Water Stone to evolve him into a Vaporeon. He still wears the swimming goggles he used to wear as an Eevee around his neck. He’s very easily scared by Grass-types and Electric-types, but he finds Rock-types, Ground-types, and Fire-types easy to be around. Additional Fact: Likes to relax. Ah, the adorable Glen. Glen is No. 3 on our count-down, and all he really wants to do in life right now is meet a nice girl. Unfortunately, he hasn’t had the best luck with that yet, even though his older brother Turbo tends to help him (or at least, try). Still, Glen has fun playing with his little sister Sylvia and big brother Turbo, as well as Bree, Zoe’s Umbreon and the only “eeveelution” not related by blood to the others. He also enjoys a battle every now and then, using an interesting distance tactic with the combination of the moves Hail, Icy Wind, and Blizzard. And with a base Special Attack stat of 130, he’s fairly well equipped for that. He’s the same height as Turbo, which is another why they’re so close, and he has weaknesses to Fighting-types, Steel-types, Rock-types, and Fire-types, which is one of the reasons he developed the distance tactic for battling. Plus, he has strengths against Dragon-types, Grass-types, and Flying-types. Had he been born with a hidden ability, it would’ve been Ice Body, just like all other Glaceons. He evolved when he leveled-up around a large, strange Icy Rock. Glen likes to wear a black fabric collar with a silver snowflake button on it. For any interested young PKMN in the Field egg group, Glen enjoys snuggling under fluffy quilts, hot cocoa, and naps by the fireplace. This is Lance, the oldest of the “eeveelution” family, and also the most down-to-earth of the bunch. Lance is No. 2 of the count-down, and while he might not be the most playful, he loves all of his siblings dearly. His best base stat is his base Defense, which is at a mighty 130, and it’s followed closely by his base Attack stat of 110. He has weaknesses to Fire-types, Ice-types, Bug-types, Poison-types, and Flying-types, but strengths against Water-types, Ground-types, and Rock-types. Lance’s favorite moves would be Grass Whistle, Aerial Ace, Leaf Blade, and Last Resort, which also happens to be his own customized moveset. The hidden ability he could’ve had, had he been born with one, would’ve been Chlorophyll. Lance is 3′ 3″ like Moses and Sylvia, and he has a wide variety of hobbies. Lance enjoys reading, practicing playing music using Grass Whistle, a battle every now and then, and secretly enjoys growing bonsai trees and catching up on Dr. Who when no one’s watching. He evolved by leveling up near a large natural formation called a Moss Rock. He also wears a red, wool scarf that Zoe bought for him shortly after he hatched, and he loves it because it smells just likes her; not that he’s ever told anyone. Additional Fact: Alert to sounds. Finally, drum roll, PKMN No. 1.5, Umbreon! Bree here is officially the last PKMN of Pokémonth celebrated this year, and also one of my most favorite PKMN in the whole world. Some of you might have noticed that the picture of Bree here is differently colored than the picture of Umbreon in the header up above, and that is because the Umbreon up top is a normal Umbreon, and Bree is a shiny Umbreon. 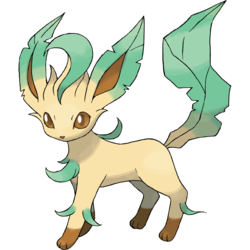 Bree’s 3′ 3″ like Lance, Moses, and Sylvia, but unlike all of the “eeveelutions” listed above, she is not related to any of them by blood. However, she acts like a dear sister to every one of them, and often helps Sylvia when it comes to “girl things”. Bree spent the most time out of all of the “eeveelutions” with Zoe, and while I won’t divulge the circumstances around her evolution, I will say that it happened at night or in a place where night was simulated, and that her evolution was possible because of her strong bond with Zoe. Bree’s best base stat is her Special Defense, which is (of course) 130, and pairs well with moves like Psychic and Dark Pulse. Like all Umbreon, Bree could have had the hidden ability Inner Focus, but she’s proven herself to be quite handy, even without it. She has weaknesses to Fighting-types, Bug-types, and Fairy-types, and strengths against Psychic-types and Ghost-types. Bree likes to wear half of a ying-yang symbol, carved out of a Dusk Stone, on a cord around her neck. The cord is threaded through the little hole in the carving, and it has been supposed that the carving has mysterious power, since no one knows how she got it, not even Bree herself. Secretly, Bree has sometimes wished that she wasn’t a shiny PKMN, because she feels like she gets attention she doesn’t deserve. So there we have it! It’s a day late, and I’m sorry for that folks, but we’ve finally covered over 30 of my top PKMN! I hope you all enjoyed this as much (or more than) I did, and until next time, merry Pokémonth!